The leader of Voltron, the Black Lion's incredible power is known throughout the universe! 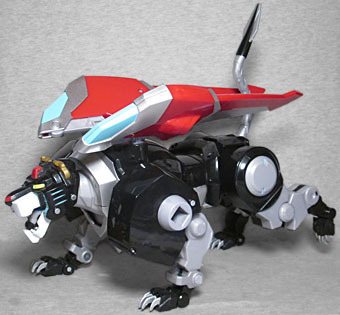 Piloted by the fearless leader Shiro, the Black Lion forms the decisive head of Voltron. It takes a true hero and skilled Paladin to fly this Lion as it demands the most energy from its pilot. The Black Lion is a courageous fighter equipped with a powerful Jaw Blade that strikes down its attackers. The Black Lion is the most skilled in combat of all the lions. It's also the biggest and most impressive of the lions, stepping one size-class up from the standard even before you consider all the extra armor. 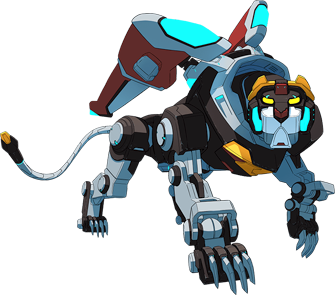 The Voltron lions went through a lot of different designs before the show settled on their final look, with design supervisor Christine Bian admitting that one of the passes at Black somehow managed to look more like a zebra than a lion. Boy, how much would you like to see that drawing! Fortunately, they kept working, so we end with a lion-shaped lion. Like the other robots, Black Lion looks like a normal animal wearing heavy armor - though in his case, the proportions make him look like one of those swole greyhounds, with super-wide shoulders, thick legs, and a massive chest. The neck, legs, and midsection are all unarmored, and the tail sticks out behind, coming to a spear-like point (rather than the cannon ports all the other lions had). 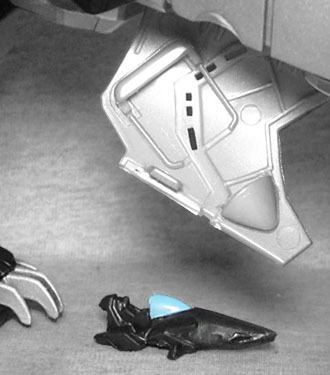 The feet are black, but the claws remain silver, because you want your enemies to notice them and know what's coming. The head on this lion is not quite as blocky as it was on the others: it's still unmistakably mechanical, with plenty of straight lines, but those lines aren't perfectly parallel to one another. It has yellow eyes, a white muzzle, and, since black wouldn't stand out in this case, a red nose. The bump on the chin is wider than usual, and has a triangular shape, and there's a red bump on the forehead that meets a black ridge running back between the golden ears. There are bright blue vents on the front of the cheeks, and three blue "whiskers" on the side of each cheek behind that. The articulation is probably as good as it could reasonably be - like, there are swivels and hinges at every joint you'd expect in the legs, but you can't get really natural or dynamic poses without making some of those swivel/hinge combos. Want to pose the legs like he's running? Sure. Want to spread them out like he's about to pounce, or defiantly standing in the way of an enemy? Eh, sorry. You can pose his tail, via its hinge, and you could move the wings on his back if you felt like it, but those are pretty much always in the same position when he's in Lion mode. You can't even open his mouth, for obvious, giant-robot-related reasons. Like the other toys, this one also has a panel on the chest that hinges open to reveal the Black Lion's speeder. The speeders are basically little hoverbikes the pilots can use to maneuver in spaces where a humongous robot lion would be too cumbersome. 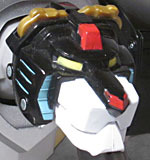 They all have unique designs, though Black's is very similar to Blue's - and since the toy doesn't get as much paint as the prototype images showed, it's nearly a featureless black lump. 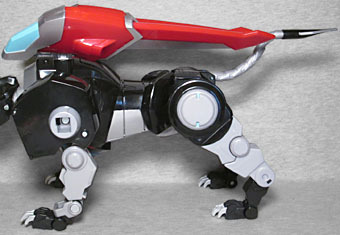 The Black Lion doesn't come with any weaponry, probably because that part of the budget went to the internal electronics - press a button on its side, and you'll hear sounds and clips and phrases. Allegedly there are more than 50, with new sounds being unlocked as other Lions are transformed and attached to this one. Is that true? I don't know, I used the handy switch on his back to turn that feature off right away. I'm not here for sounds in any of my toys. 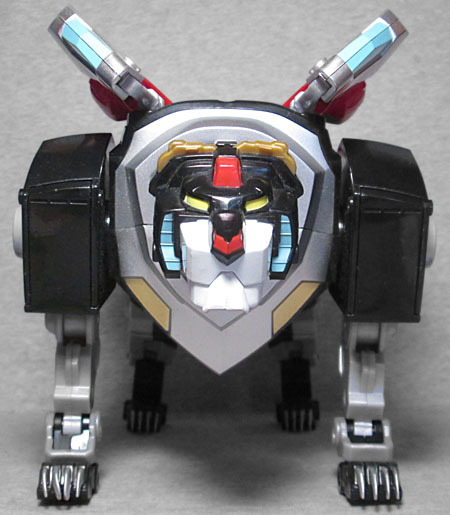 The Black Lion is the decisive head of Voltron. It will take a pilot who is a born leader and in control at all times, someone whose men will follow without hesitation. This toy is impressively large even by itself - 9" not even counting the tail - so you know the fully combined Voltron is going to be a sight to behold!